�I remember very distinctly the first mention I ever heard of West Carlisle. It was in 1853, three years before I ever saw Coshocton. I was in Cleveland, and was invited along with an old friend to spend an evening at the home of a Presbyterian minister of the city, who was just then quite in the eyes of the citizens. He had come to the City a little time before to establish an old school Presbyterian Church. He had out of his own private funds bought a house of worship, one built by the Millerites or Speedy Adventists, a round structure with one round window in the center through which it was planned to make the ascent to Heaven with the Christ at His coming at the end of the world. On two occasions the people had assembled with their ascension robes. After the second disappointment, they lost faith, the congregation dwindled and the property was in the market for sale and, having been bought and remodeled, served for a number of years for a good Presbyterian Congregation, gathered by the Minister, whose home I was in, at the time I have mentioned. That Minister was Rev. Frederick T. Brown, and he told me his boyhood home had been in a little village of Coshocton County, called West Carlisle, a number of early settlers of the place having coming from Carlisle, Pa. Brown had a brother who for many years preached at Valparaiso, Indiana. They were both men of more than average ability and success. The father was for many years the chief store keeper at West Carlisle. Besides the Browns, another Minister who was for many years quite prominent in the Congregational Church, had his boyhood home in West Carlisle, Rev. Mr. Billman. Not long after coming to Coshocton, I visited West Carlisle in connection with a meeting of Presbytery. On two occasions I long years ago visited the place to solemnize the marriage of the late Thomas LeRetilley of Roscoe and Barbara Ault, and also a daughter of Thomas McKee and Mr. Smith, son of County Commissioner Smith of that vicinity - a brother of our Dr. T. J. Smith, who for many years afterwards was a well established merchant in Utica. I soon learned that the town and the region round about was one of the best in the County, and the history of it shows a goodly number of solid and worthy people. I readily recall on the moment the Henderson, the Preston, the Cochran, the Gault, the White, the Graham, the Chaney, and other families. As a rule the family connections were large and the character and influence upon the region was of the best sort. William Henderson, long since dead, and whom I never saw but once, must by all accounts have been a man of marvelous energy and shrewdness. Thomas McKee, whose last years were spent in Columbus, was County Commissioner, while his brother George, was in the Legislature. I saw much of them and esteemed them greatly. Robert Cochran, for some years before his death identified with Trinway, and his wife whose death occurred at that place only a few weeks ago, were people of note and most highly esteemed. A son, Will Cochran, was for several years a resident of Coshocton, engaged in the practice of law, having an office in the Democrat Building, and so a near neighbor of mine. Subsequently he was in business operations in Pittsburgh. He was a pleasant, brilliant fellow with more energy and ambition than bodily strength and died at Newark in the fullness of his young manhood of consumption leaving a widow, whose maiden name was Sturgeon from about Spring Mountain, and a son who practiced Dentistry in Coshocton for a brief period, now living at Trinway. Bernard Preston, (he was called Old when I came to the COunty, perhaps there was then a young Bernard), with a vigor most noticeable still abides in that vicinity, losing nothing of the respect of his old neighbors in his multiplied years. A son and several grandsons are now well known residents of Coshocton. The Whites, of old Virginia pioneer stock, have made their mark in industrial and public house and political lines. One of the older generation, complimented me not long since by declaring he had read more about me than about Napoleon Bonaparte. One of the family has been for several years well established in the jewelry and optical business in Columbus. The Gaults of whom is our fellow citizen, Ex-Judge, William R. Gault, have, as many other large family connections, been please to avail themselves largely of my services as a solemnizer of marriage. Their careful industry and thrift have made them well-known in the vicinity and abroad. The town of West Carlisle was platted* and started in 1821 by William Brown and William Anderson. 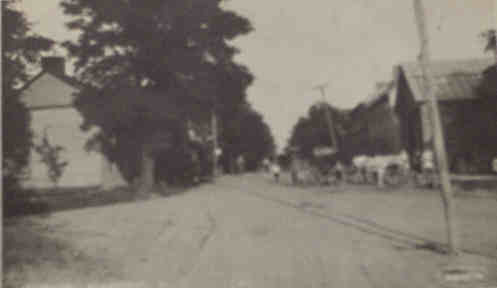 Its natural and healthy growth of late years has been somewhat affected by the establishing of the new railroad town of Cooperdale, some three miles away. The old town may be a little somnolent in these days and not see many �hot times,� but it retains its old time dignity and points with pride to the record of its former and present citizens. I think that after the town of Coshocton and perhaps one other locality, the township of Pike and part of Perry and part of Washington, central about West Carlisle, have furnished me with more cases in the wedding line than any other district of the County. And they are not all in yet. Only last week I had one. *There are other accounts of the platting of West Carlisle - this is but one. Drugs were in crude form, instruments were scarce. I once saw after I came to Coshocton, an enema administered to a small child with a great 10 inch long pewter syringe, and I have been told that when an arm was amputated in 1847, a saw brought from one of the butcher shops was used. In very early days there was a scourge cold plague- some say congestive fever - affecting chiefly the rich valley regions. In the 50�s (1850) Keene had a visitation of the cholera. At the close of the War (Civil) Coshocton had a number of cases of unmistakable smallpox. Of late years, there have been several epidemics of typhoid fever and scarlet fever. Lot 111 Alley R. H.
Lot 110 Alley R. H.
Lot 107 Alley R. H.